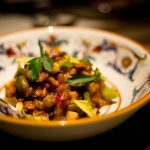 This recipe for is for the Sicilian appetizer Eggplant Caponata, also known in some areas as “Garbliadena”. This recipe comes from my grandmother and like many Italian grandmothers it is done from memory. Measurements are virtually non-existant so you can adjust the ingredients to your personal taste. Sautee eggplant, onion and celery in olive oil until softened. Add stewed tomatoes, olives, capers, raisins and pinenuts. Bring to a boil then add salt, pepper, red wine vinegar and sugar. Simmer until ingredients are well blended. 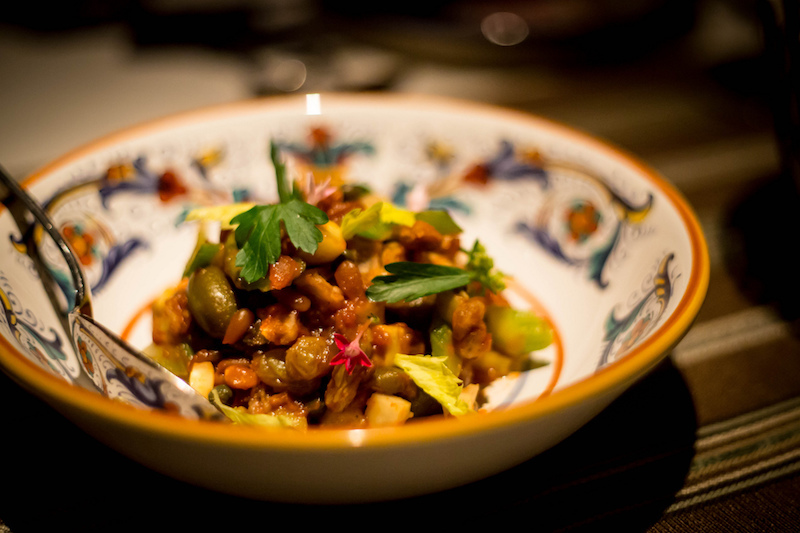 Caponata should have a good eggplant flavor that has bit of a sweet and sour undertone from the sugar, vinegar, capers and raisins. You can serve this warm or cold on Italian bread, bruschetta, crostini etc... and it gets even better the next day.